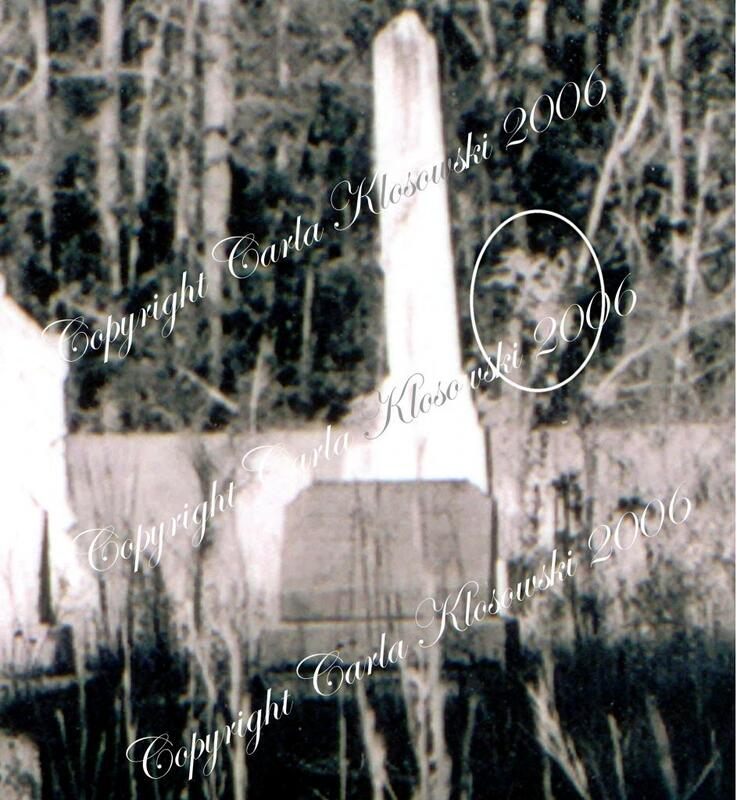 A few notes on the cemetery photos...Again no image was retouched. While I was at the cemetery there were strange things occurring, from fast moving bright red orbs to voices in the area, sharp whistles and I was actually choked by an unseen entity. The voices and whistles didn't belong to anyone in my group! While I was doing an investigation, there was a man who brought his kids out to see the cemetery, and I was doing a last bit of EVP/Image collection and when I was done, the man's youngest son asked me if I had been talking to a man, I told him that I was asking questions and seeing if my recorder could hear what I couldn't and he said to me, "Well, while you were there inside the gate, you were talking and there was a man standing near you." I asked him if he could see the man and describe him, and he said he could see the man, but he was more of a shadow. That was fantastic! These images have been viewed by quite a few people, including a priest (whose name I won't mention here for privacy purposes) and he even saw the manifestations in the photos I had taken. 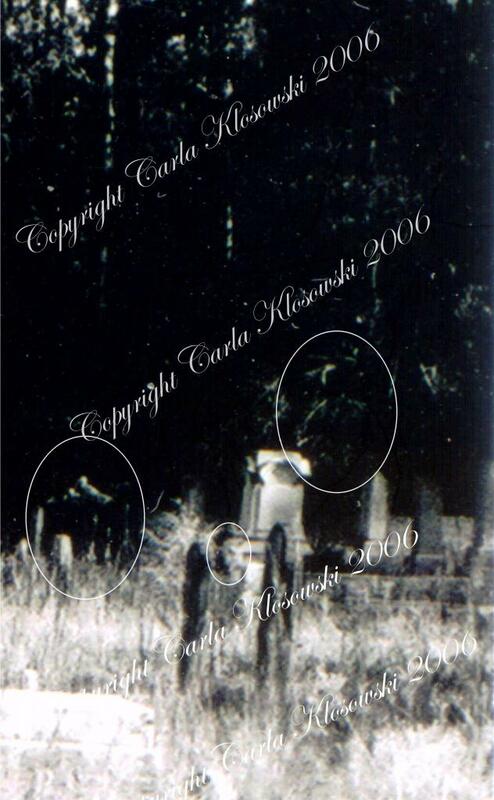 The image above was photographed on the same evening at the cemetery during a full moon. This time I photographed into the darkest corner of the area. I have circled the areas where apparitions have been recorded. To the top right, into the shadows, there is the distinct illuminated outline of a man's head, shoulders and upper torso, and he is in a suit jacket of some type. On the original photo you can actually make out the lines of the lapel on the jacket. To the left, just a bit lower, there is an arched ornate line, this was captured at the area where a gate opening is, but there is no actual gate there. Yet, here in the image is the distinct image of an ornate gate, perhaps some type of wrought iron. This would seem to suggest that a portal perhaps was open at the time I took the photo. Just below both these images there is a 3rd circle there. 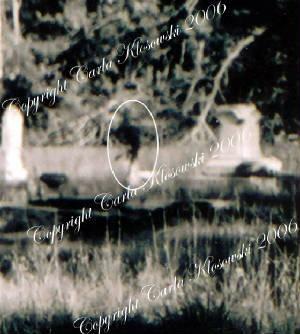 This one contains what appears to be the figure of a man, squatting at the edge of the large tombstone, and looking towards the camera. PLEASE REMEMBER THAT ALL IMAGES AND TEXT HERE ARE COPYRIGHT PROTECTED----NO IMAGE HERE HAS BEEN RETOUCHED!!! This image was recorded the same evening. 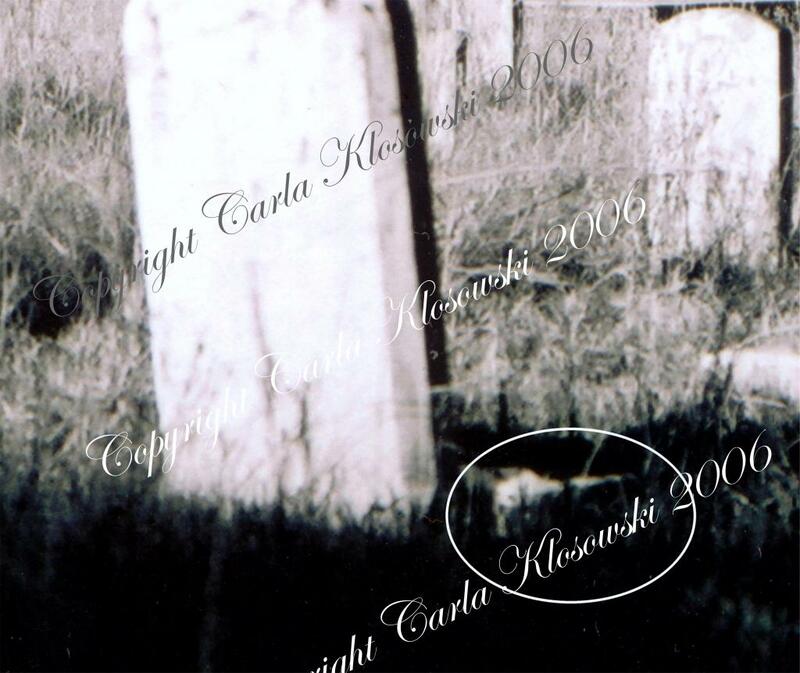 If you will look carefully at the circle to the lower right of the large tombstone, there is the apparition of a small white dog, with black ears, lying near the stone. I saw no animals in the cemetery that evening. NO IMAGE HERE HAS BEEN RETOUCHED!!! ALL IMAGES AND TEXT ON THIS SITE ARE COPYRIGHT PROTECTED AND NO IMAGE HAS BEEN RETOUCHED!!!! ALL PHOTOS, INFORMATION AND THE NAME SEPIA RESEARCH (SOUTH EASTERN PARANORMAL INVESTIGATION AND RESEARCH) ARE COPYRIGHT PROTECTED AND ARE THE PROPERTY OF CARLA KLOSOWSKI-SALTER AND SEPIA RESEARCH AND CANNOT BE USED WITHOUT EXPRESS WRITTEN PERMISSION OF THE PHOTOGRAPHER INVESTIGATOR AND/OR THE RESEARCH CENTER.